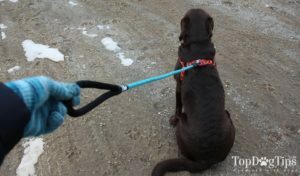 Many dog owners believe that all leashes are pretty much the same. They may be made from a different type of material or be of different lengths, but what could really make one leash so much better than another? The SparklyPets Rope Dog Leash isn't your standard leash, and I'll tell you why in this detailed review. 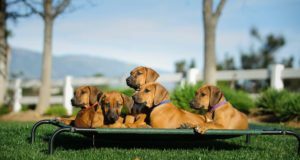 When you’re considering the dog leash that may be right for your pet, the material that it is made of should be the first thing you consider. I don’t recommend retractable leashes for any dog, because there are more dangers than advantages to this type of leash. Nylon is the most popular material used to make dog leashes, because it’s cheap, durable and easy on the dog walkers’ hands. The SparklyPets Rope Dog Leash is made of nylon, but it's not what you would expect. Here's what I found after trying and testing this new type dog leash with my Saddie. This is referred to as a rope dog leash, but it's not your typical rope. The SparklyPets Rope Dog Leash is made of a tough braided nylon rope, and is said to be chew resistant. As you'll see in my video review, Saddie has a tendency to bite her leash when I first put it on her. She stops after we get going for our walk, but she's so excited at first that she bites at the leash. We've used the traditional nylon ribbon leashes in the past, and they start fraying after a few months because of Saddie's biting. I'm happy to say that after a few months with the SparklyPets Rope Dog Leash there are no signs of fraying. The braided nylon rope is definitely more durable than traditional nylon ribbon leashes. I was also pleased to see that the nylon braiding features reflective pieces woven in. Many pet owners walk their dog early in the morning or in the evening after work. It's important to keep yourself and your dog highly visible when walking during these times of the day. If you watch my video review above you'll see that this leash actually comes in 2 pieces. You get a standard 3.5′ leash a 2′ bungee extension. The shock absorbing bungee extension offsets the strain of a dog that pulls on the leash. I always recommend dog owners purchase a leash with a traffic handle. You never know when you made need to keep your dog close or get him under control in a difficult situation. 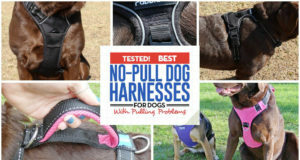 I was happy to see that the SparklyPets Rope Dog Leash has a traffic handle, which you can see in the photo on the right. This leash is available in three colors. I have the blue leash, and it's also available in green and grey. It also comes with a 90-day guarantee. If you aren't satisfied with product you can get a full refund. The higher quality craftsmanship and additional features will obviously cost you more than a traditional nylon ribbon leash. You can pick those up at your local pet store for about $5. The SparklyPet Rope Dog Leash retails for $16.95 on Amazon, but I believe it is a good value if your dog tries to chew or pulls on his leash. 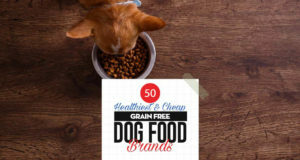 Shopping for a dog leash sounds like a simple task, but with thousands of different models available it can be a lot more difficult than most pet owners think. The SparklyPets Rope Dog Leash is made of tough braided nylon and comes with a helpful bungee extension. What sets this leash apart from others? Find out in this detailed review.